During January in Omaha/Council Bluffs and it was really cold. We were having sub zero temps at night and during the day the temp never went above ten. Add the wind chill and it was really cold outside. My wife Pam always finds things for us to do instead of sitting around in blankets reading and watching the idiot tube. You watch that thing for any length of time and your eyes get bigger and your brain gets smaller. My father said that to me when we got our first TV. This weekend was St. Cecila’s Cathedral for their annual Flower Festival. This is an Omaha tradition and one that will give you a bright break from the middle-of-winter doldrums. 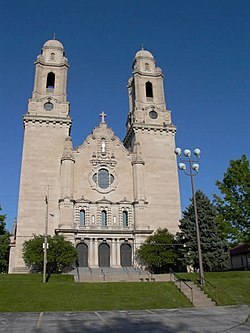 Construction began on the Cathedral in 1905 and was consecrated in 1959. It was listed as one of the ten largest Cathedrals in the country when it was completed. It is listed on the National Register of Historic Places. Pam and I have traveled all over Europe and especially eastern Europe and have been in many churches and cathedrals. St. Cecilia is one of the grandest we have ever been in. We always look forward to attending the festival every year. More than 30 area florists created displays for the event. Last year the event celebrated Nebraska’s 150th anniversary with exhibits honoring the state’s history. This year the planners built on last year’s success with numerous displays. The event also honored the the American Institute of Architects, Nebraska Chapter. Enjoy the displays. The Cathedral dome is magnificent. I have been following the temperatures up at Spirit River in Alberta, Canada where I will be hunting moose. They have been warmer than we have been. Also, St. Anthony, Idaho where I hunted Elk last year has been warmer than our area and they are only an hour from Yellowstone.